FEMA Announces FY18 PDM and FMA Application Cycle - Arkansas Floodplain Management Association, Inc.
FEMA has posted the Fiscal Year 2018 (FY18) Notice of Funding Opportunity (NOFO) announcements for the Flood Mitigation Assistance (FMA) and Pre-Disaster Mitigation (PDM) grant programs on www.grants.gov. These NOFOs provide an overview of the grant programs and details about the agency’s funding priorities and review process. 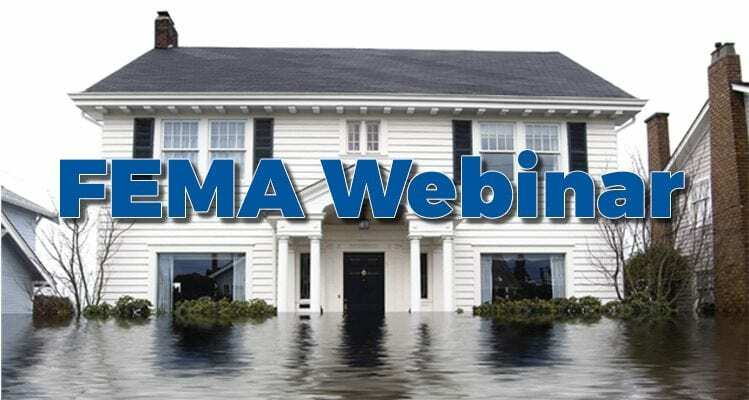 FEMA will offer a series of webinars in August and September on the FY18 NOFOs for prospective applicants and how to use the Mitigation eGrants system that is used to process grant applications. Applicants may attend any session. Upcoming sessions are listed below. View the complete webinar schedule. For the online portion, please join via the Internet: https://fema.connectsolutions.com/nofo18/ and for audio, please call 1-800-320-4330 and enter conference code 338559. Primarily intended for sub-applicants and new users. For the online portion, please join via the Internet: https://fema.connectsolutions.com/beginnersegrants/ and for audio, please call 1-800-320-4330 and enter conference code 338559. Primarily intended for grant applicants, experience sub-applicants, and power users. For the online portion, please join via the Internet: https://fema.connectsolutions.com/advancedegrants/ and for audio, please call 1-800-320-4330 and enter conference code 338559. FEMA will open the FY18 application period on October 1, 2018. Eligible applicants must apply for funding through the Mitigation eGrants system on the FEMA Grants Portal accessible at https://portal.fema.gov. All applications must be submitted no later than 3 pm Eastern Time on January 31, 2019. This entry was posted in Announcements, Email Announcement.